What are four letters that can send shivers down the spine of any email marketer? 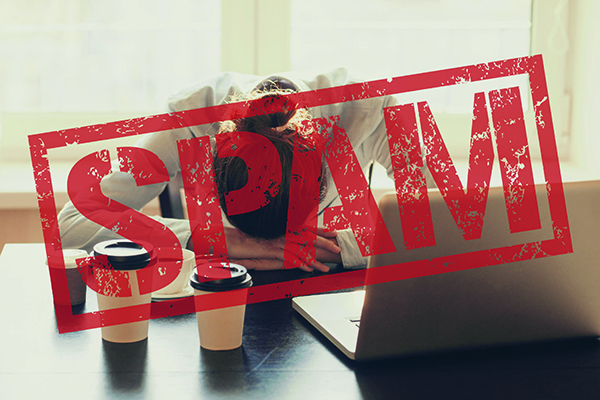 Trust us, we don’t like the sound of it either, so today we’re going to lift the curtain on spam and talk about how and why it happens, along with what you can do to help prevent it from happening. Spam, defined by Wikipedia, is unsolicited bulk email, UBE for short. Unsolicited: Something that is not asked for. Bulk: Sent in a batch of more than one. Email: Electronic communications you and I send on a daily basis. So basically as long as I don’t send a whole lot of emails to people who don’t even want them in the first place, I’m in the clear, right? That would make the most sense, yet that’s not always the case. How does an email get flagged as Spam? There are the obvious phishing scams from our deceased second great auntie’s housekeeper in some far off land asking for our bank information to claim the $2 million inheritance waiting for us, OR the emails with blinking, animated emojis in the subject lines, which are both clearly spam. And then there are the more subtle forms of spam such as the instant deals we need to take advantage of right away, faux census surveys asking for personal information, make money online fast deals and more. So what exactly classifies an email as spam and another as not? Unfortunately, there is no clear cut answer. Internet and email service providers diligently update security settings and increase protection to reduce the amount of spam which makes it’s way into inboxes across the world. While there is not a clear guide to avoiding spam, things such as phishy content (i.e. something that reads of a scam or fraud), a poor sending reputation of your email address or email service provider, and even a clickbait headline are a few ways an email can be relegated to the spam folder or bounced completely. There are many resources available that list spam triggers (words and phrases to avoid in email communication for fear of being labeled spam). After scouring page after page and reading about 99.9% of these lists, we highly recommend this guide from our friends at HupSpot. Divided into categories, it is an incredibly comprehensive list of words and phrases that when used repeatedly, or mixed too freely together, can trigger spam filters. Print it out and highlight the ones you find yourself most commonly using throughout your content. This is also a great reference should any of your emails be categorized as spam. Scan through to see what content could have triggered this reaction and adjust your concept moving forward. Is there anything I can do to prevent my emails from being marked as Spam? As a publisher, being well informed of how spam filters work and what words and phrasing are possible triggers will help you tremendously. Lots of unnecessary exclamation!!!!!!! points!!!!! Are you repetitive with keywords and phrases? Is there another way you could state something as opposed to repeating it multiple times? This is where writing creatively can come into play as a publisher. Adjust your content as necessary to deliver your message while still staying in line with best email practices. Remember that SEO guidelines evolve and you no longer need to repeat your keywords like a machine to rank high in Google. This technique is now seen as keyword stuffing with concise readability being the clear winner. What is FeedBlitz doing to prevent my emails from being categorized as Spam? We work very, very hard to protect our sending reputation! Remember how we talked about that during the hard bounces post? These vital steps work to prevent your emails from landing in a subscriber’s Spam folder. Major ISPs like FeedBlitz, and we intend to keep it that way. Another precaution we take is to have our own spam filters and traps in place. If an email you craft pings a spam trap, it isn’t sent. You’ll be notified via email should this happen and can contact our Support Desk for assistance. Usually it’s a matter of simply rewording a phrase or two, however, in some cases a complete rewrite is necessary. What do I do if someone marks one of my emails as Spam? Ah, yes, hitting the spam button on an email. Maybe you’ve even hit spam on an email, intentionally or not, a time or two. FeedBlitz likes to consider what we call the “people factor” when it comes to a subscriber hitting spam on an email. Not all subscribers are aware of what selecting spam means and can select this if they simply are not interested in the content or wish to unsubscribe to your email updates. One or two occasional subscribers hitting spam on your emails falls into this “people factor” category and will not cause your account to be suspended. An influx of Spam notices, however, will cause us to take a closer look at your account. Unless a large change has occurred (i.e. re-branding or increased advertising), this should cause you to reconsider your content as well. If your account is determined to be primarily focused on Phishing and Spamming your subscribers, it will be revoked. Why? Well, we have the sending reputation of all of our publishers to consider, and unfortunately, too many bad apples can ruin the bunch when it comes to email marketing. For more information, please read through our Terms of Service here. Have you landed in a spam folder before but still aren’t sure why? Send us the email to support@feedblitz.com and we’ll take a look and offer insight for you. And as always you can chat, check out our Help Forum, or give us a call at 1.877.692.5489. Our Support and Sales Desk is available Monday – Friday from 9 am to 5 pm EST.